A new robot designed to help decommission reactors at the Fukushima nuclear plant is to undergo tests before entering the harsh radioactive environment, it's been reported. The cameras, which are mounted on top of the robot, will give a panoramic view to scientists who have so far been hampered by a lack of clear information. "We've expanded the field of vision, so it should give the workers operating the robot a bird's-eye view of what they're doing," an unnamed project official tells The Mainichi. The Fukushima plant suffered a meltdown after a massive earthquake and subsequent tsunami in March 2011. Efforts to clean up the site have been repeatedly held up by obstacles blocking remotely-controlled devices, as well as high levels of radiation inside the power plant. 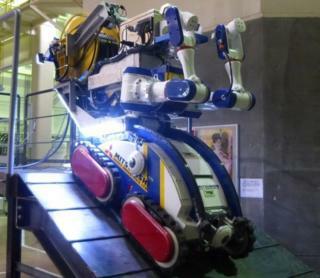 In April, a robot failed after three hours inside the reactor building, and while a flying drone has been tested for use at the site, it has not entered the most badly damaged buildings. It's estimated that decontaminating the Fukushima site will take up to 40 years and cost tens of billions of dollars.